When school is out for the winter holidays, it’s time to bundle up and hit the road — and stay safe along the way. When the weather is unpredictable and kids get rowdy, it’s important to plan ahead to make sure they stay happy and occupied while you stay focused. Since safety is our No. 1 priority (and we know it’s yours, too), we thought a few tips would help beyond the obvious “check your windshield wipers and tire pressure” line already on your to-do list. Plan for a comfortable drive. The best preparation is to make everyone feel cozy for a long drive. 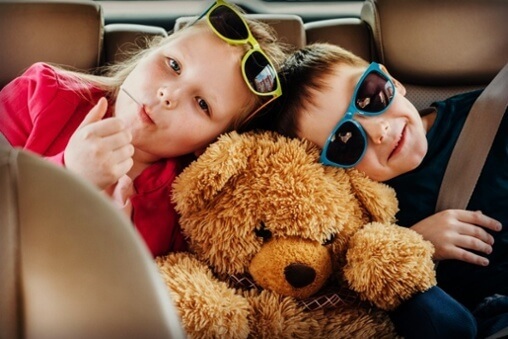 Bring a favorite pillow, blanket or stuffed animal to aid with car naps. Leave the heavy boots in the floorboard and heavy coats in the back. Instead, stock up on warm socks and cozy layers that can be easily removed so everyone can be happy without arguing over the car heater. You may face inclement weather along the way, so prepare yourself by thinking about the worst scenarios and how you can react. If you get stuck on an icy patch, cat litter can help your tires gain traction, so pack some in the trunk. Add a small shovel, de-icer, headlamp, and first aid kit for hazardous situations. After being cramped in a car, everyone needs to take a restroom break and stretch their legs. Before you leave, look for towns or attractions along the way that could make for pretty views or funny stories, even if you’re only stopping for a few minutes. This is an ideal time to make sure kids are hydrated and stocked up on healthy snacks, too. Make sure you’re prepared with plenty of adapters and cords for the family so no one misses out on their favorite tunes, shows or games. External power sources could be great for trips away from the car or times when all of the outlets are taken. Allow kids to create playlists and take turns choosing their songs. For a preoccupied drive, kids may need several activities to stay engaged. Pack a small plastic bin for each with books, games, arts and crafts, cards, and activity pads they want to bring. This limits how much you take along, and the kids can keep track of their bins with their special items inside. This is also a good place for individual flashlights, lip moisturizer, and a small packet of tissues that kids can grab on their own without asking the driver for a distracted hand.